Another pre-PMA release and this time from Kodak. 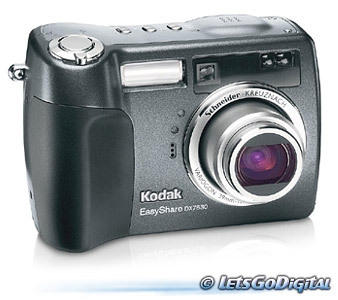 Kodak makes the big step into the 6 Megapixel league by introducing the new EasyShare DX7630 camera. This could be an interesting consumer camera where user-friendliness and high resolution go hand in hand. Unlike other manufacturers Kodak is one of the few brands that has actually introduced a 6 Megapixels camera; Kodak is taking some serious steps. With 6-megapixel resolution, a professional-quality SCHNEIDER-KREUZNACH VARIOGON 3x optical zoom lens, precision low-light autofocus system, and a host of creative controls, the camera is well suited for the avid photographer. It will be available in April 2004 for a suggested retail price of US$499. Working with renowned German professional optics designer Schneider-Kreuznach, Kodak equipped the camera with a f/2.8 - 8.0 aspheric lens to provide striking edge-to-edge brightness and sharpness across the frame. Image quality is heightened even further with the KODAK Color Science image processing chip. This high-performance digital signal processor with professionally-derived image process engineering, including Kodak's legendary white balance algorithms, quickly and precisely analyzes lighting conditions and color balance to deliver exacting sharpness, exceptional color accuracy, and proper exposure. The latest EasyShare DX model includes Kodak's new "camera favourites" feature. With a touch of the red-jewelled Share button, people can store multiple pictures in an on-camera digital album. These pictures can then be shared anytime on the camera's large, 2.2-inch, high-resolution (153,000 pixels) indoor/outdoor LCD screen. The Share button also allows someone to immediately select photos for printing and even E-mailing, with up to 32 E-mail addresses stored in the camera's memory. For settings requiring more than a still image, the DX7630 camera can capture full-motion video (24 frames per second), with capacity only limited by available memory (32MB internal memory; additional memory can be added via the SD card/MultiMediaCard expansion slot). Automatic picture rotation makes pictures taken vertically appear right side up on the camera, computer screen or television. In addition, the camera is always ready to snap a picture by simply depressing the shutter button, regardless of which capture mode or menu is active, a feature unique to EasyShare cameras.